Cozy Chicks: Molly Malone is Back! 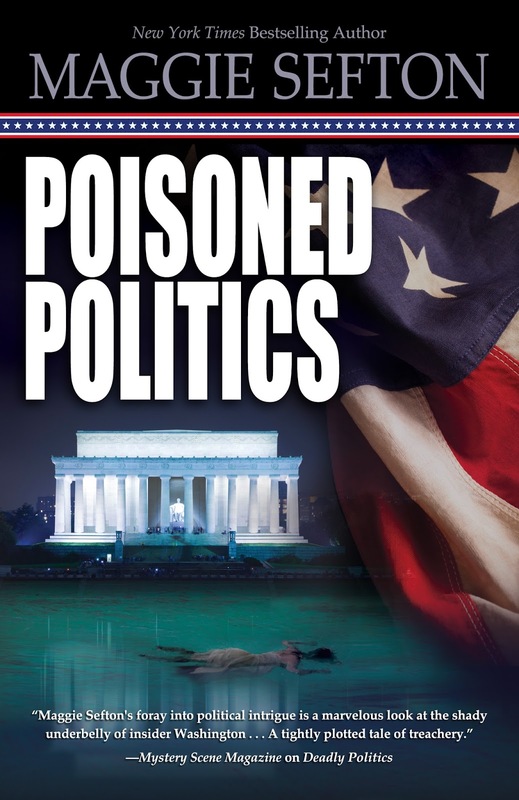 POISONED POLITICS, the second in the Molly Malone Suspense trilogy, will be released August 8, 2013 in trade paperback from Midnight Ink Books. It will be available in bookstores and online. Yes! The next book in my Political Suspense trilogy is coming out this week. Last year's DEADLY POLITICS introduced Molly Malone, the savvy and seasoned veteran of Washington, DC politics. This second installment of the suspense trilogy has Molly drawn deeper and deeper into a dangerous web of deception. The Molly Malone Suspense novels are faster-paced than the amateur sleuth Kelly Flynn Mysteries. Another big difference? There's more than one Bad Guy. In fact, there're several villains that appear on the pages of DEADLY POLITICS and POISONED POLITICS. These Bad Guys definitely have an agenda, and they're very, very good at what they do---which includes killing people. Politics is a blood sport in Washington, DC, and only the strongest survive. Like the politicians she’s rubbed shoulders with for a lifetime, Molly Malone is smart and tough and savvy enough to stay out of trouble---most of the time. However, trouble has a way of finding Molly. Years ago, Molly Malone was driven from Washington, DC by political back-stabbing, scandals, and personal heartbreak. But now, circumstances have forced her to start a new life in the one place she swore she’d never return to—the city that broke her heart---and face the ghosts and the enemies from her past. As the daughter of a respected United States Senator and once the wife of a rising star young Congressman, Molly has seen it all in Washington politics---the cynics, the sincere, and the schemers. But the brutal murder of her Congressional staffer niece brings Molly up close with Washington’s darker side. “The beautiful monuments and parks are deceiving. Washington can be ugly.” How ugly, Molly’s about to find out. There are other schemers out there who may not have won elections, but are more powerful than the politicians they ensnare. In POISONED POLITICS, readers learn that not only has Molly gotten on the Bad Guys' radar screen, she's now front and center. The back-of-the-book blurb is below. Enjoy! Beltway doyenne Samantha Calhoun has learned many lessons in a lifetime of politics, and she relishes teaching certain young congressmen everything she knows. But when her latest fling, married U.S. Representative Quentin Wilson, is found dead in Samantha's home, she turns to longtime friend Molly Malone for support. Putting to use her many well-positioned connections, Molly learns that Wilson had been researching a financial bill sponsored by a veiled coalition of politicians---the same bill that her niece Karen Grayson was investigating when she was murdered. Picking up the trail where Grayson and Wilson left off, Molly fears she will be the next victim of the shadowy cabal's insatiable appetite for power. Hi Maggie, I already have the book! It arrived last thursday, as a birthday present :). I am looking forward to reading it soon. Hi! I've eagerly awaited this second book given the cliff-hangar ending in Deadly Politics. Adrienne---Oh, I'm delighted you're enjoying Molly Malone and her adventures. 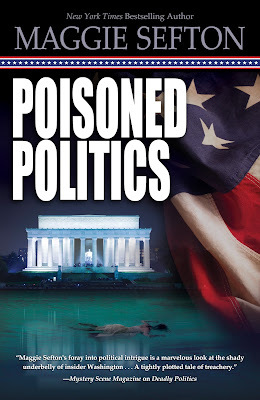 And yes, I've written book #3 and will be doing revisions on it this Sept. :) Let me know how you like POISONED POLITICS.